I’ve recently learned that dill is a polarizing herb. The circles I run in are upsettingly full of people who don’t care for dill one bit, which I don’t understand. Personally, I love the stuff, and I’ll work it into recipes where it probably doesn’t belong just because I can. Dill is just so fresh tasting and springy, which is why I decided this spring pea soup should have lots of it, though the addition of dill means Cody won’t be interested. So, more soup for me. 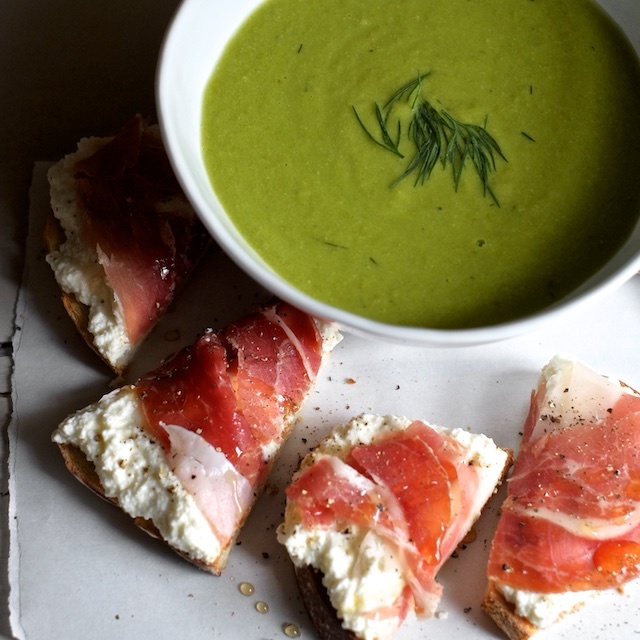 This is like a springtime appropriate nod to (deconstructed) split pea soup. 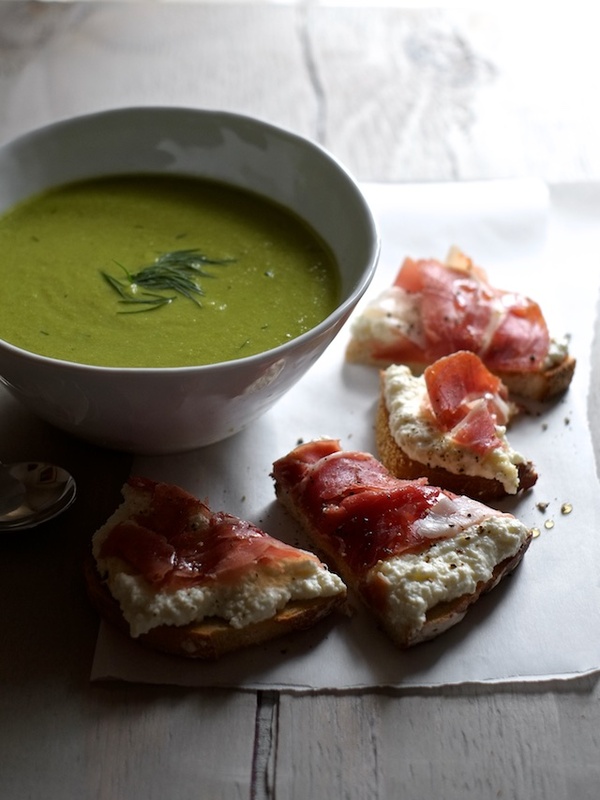 It comes together ridiculously quickly (like 15 minutes tops) and it pairs perfectly with the smoky American prosciutto I found, draped over fluffy ricotta and barely drizzled with honey. You can use Italian prosciutto if you like here, but if you can find American smoked prosciutto, it’s really good. Another acceptable sub would just be smoked ham or crispy smoky bacon. I say dill with it. 1. Sauté onion and garlic in butter in a pot over medium heat, until the onions are translucent, then add the broth and peas (straight from the freezer is fine). 2. Bring the soup to a simmer and then turn the heat to low. Using a hand blender, blend the soup until it’s as smooth as you like. 3. Add cream, lemon, dill, white pepper, and salt. Taste and add more salt as needed. If you want your soup to be thinner, add more broth or cream. 4. 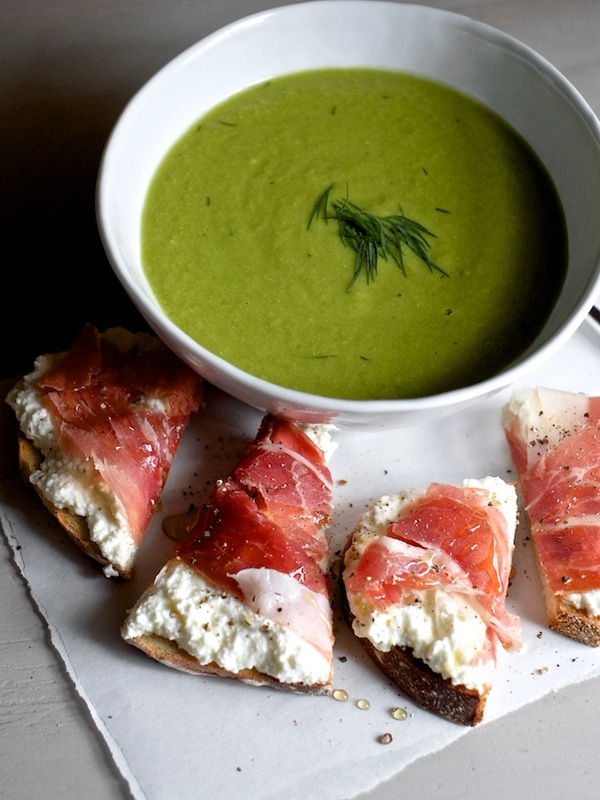 Keep your soup on low heat while you assemble your tartines. 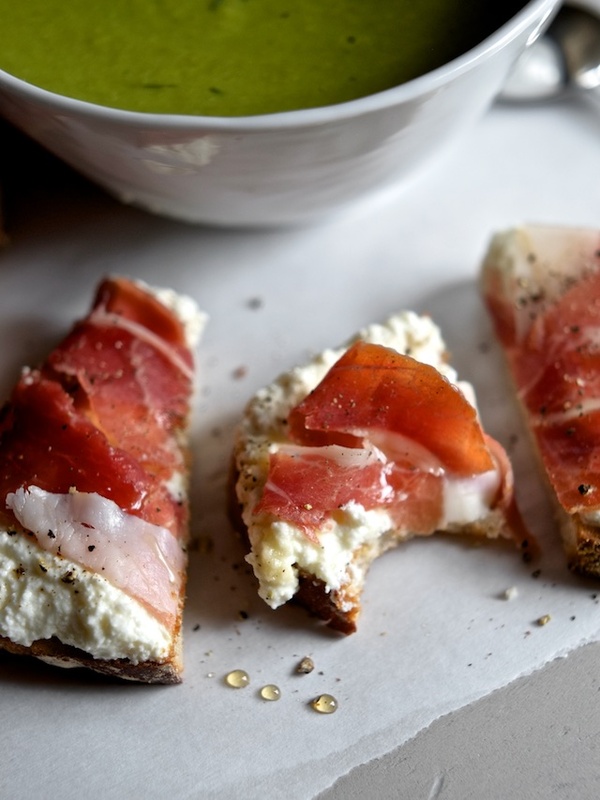 Start by toasting slices of your bread, then top with a few scoops of plain ricotta, a sprinkle of salt, a piece of prosciutto (torn into a few pieces so you can bite it without taking the entire sheet of prosciutto) and the tiniest drizzle of honey. 5. Serve the soup with extra dill, lemon, and/or cream and a tartine.